When your stones become damaged from daily use and not regularly cleaned, you need the natural stone floor restoration professionals at Modern Stone Care. 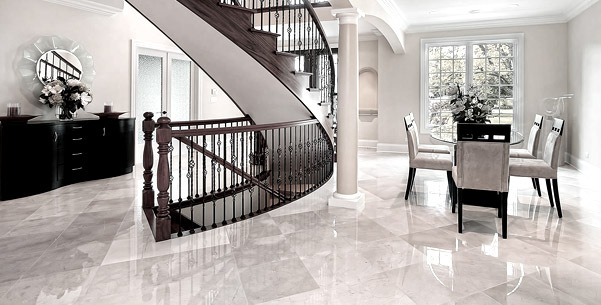 Our technicians use numerous flooring process to restore your stone back to its natural beauty. The polishing process we use emphasizes on grit along with a combination of grit compounds to bring out shine on floors. Modern Stone Care specializes in polishing, marble, travertine, granite, limestone slate and terrazzo floors. If you’re in Houston or surrounding areas and have large stone floors, it’s best to use us to polish your floors. We have 3 levels of polishing matte, satin and high gloss. Each level of shine is determined by how much shine the customer wants on their floor. Reinforcing sealing, making cleaning of liquids easier. If floors are not polished on regular basis this can lead to liquids absorbing the surface and increasing the chance for etches, stains along with expensive repairs and replacement. Cheaper than replacing an entire floor, why replace your floors when you can just have them polished to a beautiful finish. When we take on a polishing project we have one goal in mind, to exceed your expectations. We take pride in what we do and we’ll go the extra mile to make you happy. We want you to be totally pleased with our work, Modern Stone Care wants to bring your vision of your natural stone floors to life. Communication is very important to achieving a successful project. Your involved in the polishing process from beginning to the end making sure we have a complete understanding of your vision of your natural stone floors. Modern Stone Care was built on validation of our reputation, this why you can trust us with your floors. Find out more about our natural stone floor polishing service and how we can improve your home appearance with regular maintenance. Contact the flooring specialist at Modern Stone Care.